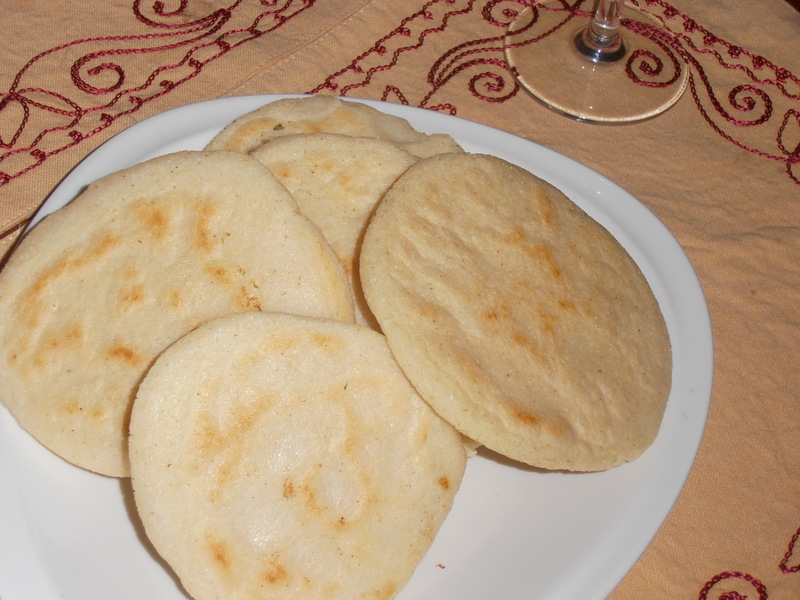 The arepa (pronounced a–reh-pa) is the staple diet of Venezuela and Colombia, which means they use it like other nationalities use bread, and indeed it is a type of bread. It is made not with wheat flour but a kind of corn flour – not the very fine stuff you use for thickening sauces, but a more gritty grade. 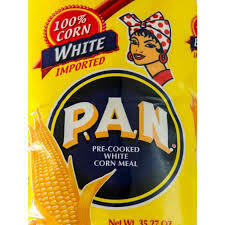 The best known is called Harina Pan and you may have to search for it; you won’t find it in many little supermarkets. But there are South Americans all over the world and they love this stuff. Having tracked down some Harina Pan, you’re on the road to a lifetime of easy meals. It’s not like baking bread in the UK or US, where it has to rise and the whole thing seems difficult. This is a knack, not an art. With arepas, the trick is in getting the consistency right – and that is all a matter of practice. We’re making this for two people, so just adjust the basic quantities according to how many people you’re catering for. If you make too much, you can put the excess in the fridge and use it a day or two later. If you don’t make enough you make some more. Arepas are quite filling, so you may find one is enough. If you eat two or more for breakfast, you probably won’t need to have any lunch. You can eat lots of things with them, from grated cheese to black beans. We’re going to do a tuna and onion salad. In a large mixing bowl, pour about a cupful of water (depends on the size of the cup, I know) and a sprinkling of salt. Then add Harina Pan, stirring with a wooden spoon, until it is a thick paste just the dry side of wet. Knead it with your hands like you would ordinary dough and you’ll get a feel for it. (One good thing is that it doesn’t stick to your fingers like wheat dough does.) Scoop out a handful, roll it into a ball about the size of a tangerine and keep rolling it around until it’s solid. Then you start tossing it from hand to hand and it will gradually flatten itself against your palms. If this doesn’t go too well at first, don’t worry. It’s the kind of thing a Venezuelan housewife can do with her eyes shut and she will always be better at it than any chef. But you will improve every time. As the dough flattens, if it starts to crack around the edges, get a splash of water on your hands – just enough to dampen them – and fix the cracks. When it is about one third of an inch thick and maybe four inches wide, you’re in business. The actual size is up to you. Bigger than four inches is harder to handle. 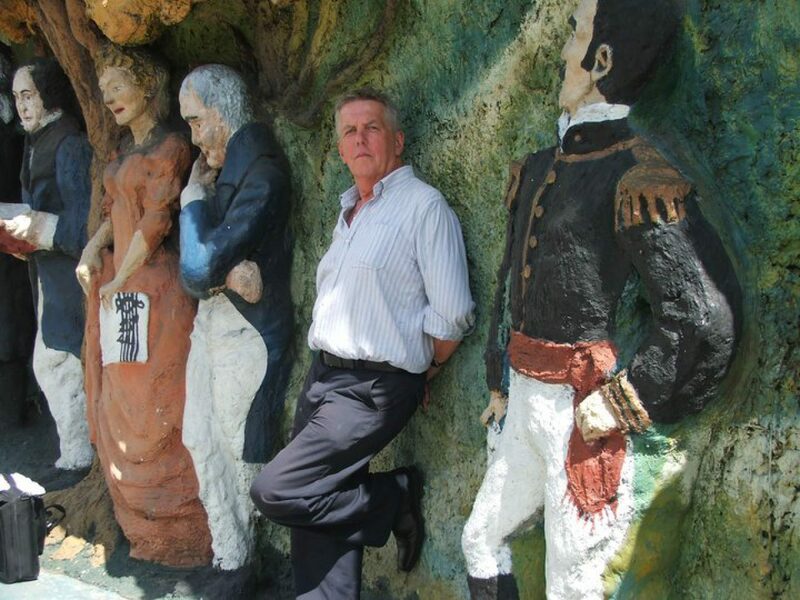 Smaller ones are cute – they call them arepitas. Heat a good, heavy frying or griddle pan but don’t use any oil. Turn the heat down to about one-third and place the arepas on the hot surface for 20 minutes or so. Flip them and see if the surface is developing golden brown marks. Do both sides until they are like that. When one load is done, put aside and cover with a tea towel. Arepas stay warm quite a long time. 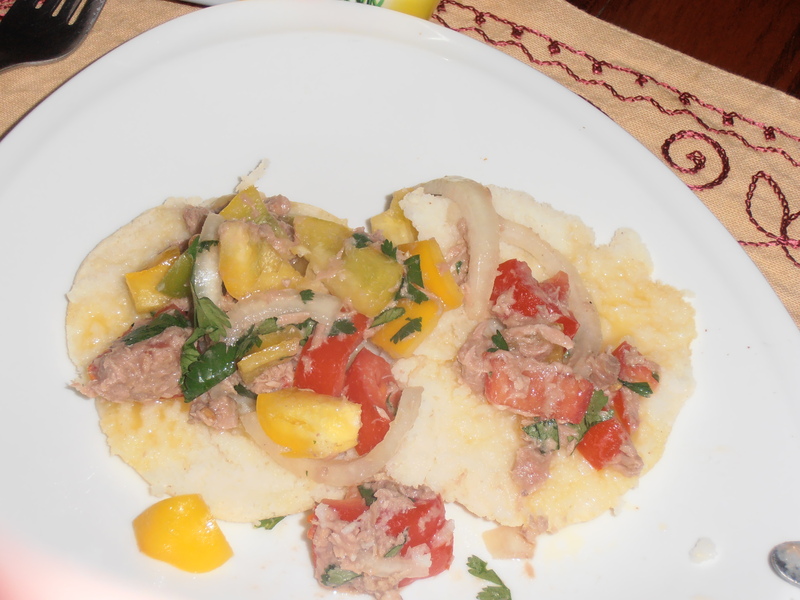 Some people like to fry arepas, which can add flavor but also adds calories. You can also bake them in the oven. Cilantro (coriander leaves) Half a handful. Drain the oil from the can and put the tuna into a mixing bowl (Christmas pudding size). Chop the pepper, cilantro and onion and mix in. Squeeze the lime juice over the mixture. Add a small glug of olive oil (if it’s not still oily enough from the can). Sprinkle on a little salt and pepper. Straight from the pan, arepas are very hot, so you may want to use a cloth to pick one up. Slice it open with a knife, working your way around the edge. Open it flat and spread some butter on, then spoon the tuna salad on. Pick it up with your hands or use a knife and fork if it’s too hot or messy for you.